Canadian real estate sales continue to cool. Canadian Real Estate Association (CREA) numbers show sales dropped to a multi-year low for December. Weakness was on display across the country, with only one major market seeing minor growth. 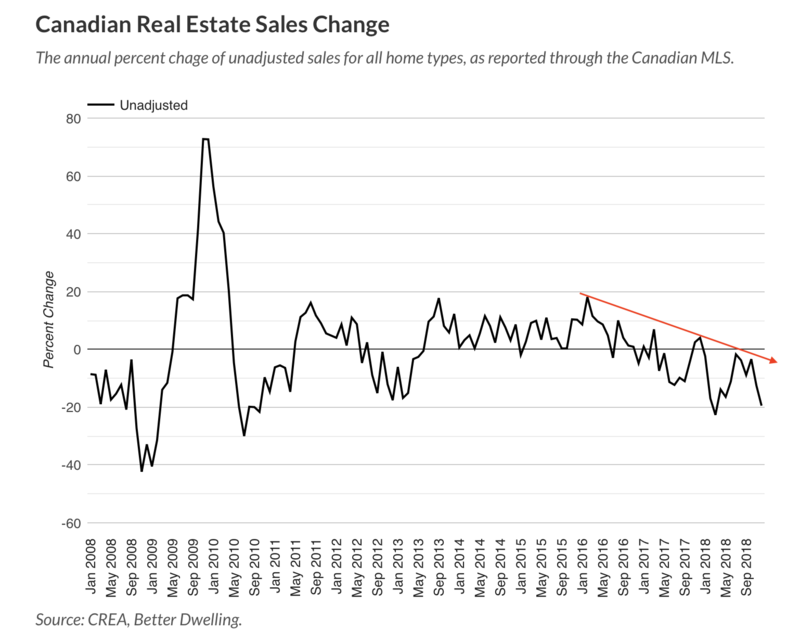 Canadian real estate sales printed on of worst Decembers in years. Only 21,909 sales went through the MLS in December, down 34.24% compared to the month before. This represents a 19% decline compared to the same month last year. December sales have only been lower twice in the past 10 years – in 2012, and 2008. Both last month’s monthly and annual growth rates were worth noting. A monthly decline is always expected in December, but this was the largest since 2007. The annual decline is the third consecutive decline, and largest since March 2018. The annual growth rate has been trending lower since February 2016. The declines were consistent across boards, but a few markets did less worse than other. 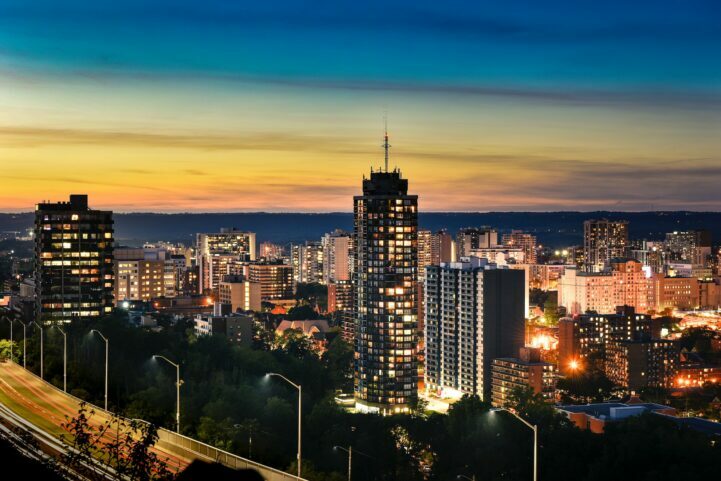 Montreal reported 2,825 sales in December, an increase of 2.5% compared to the same month last year. Ottawa reported 677 sales, down 12.9% from last year. Winnipeg came in at 495, down 14.4% from last year. 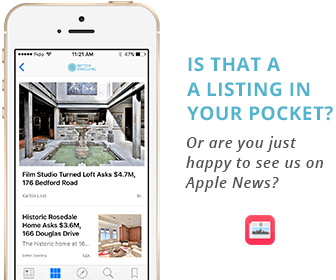 Yes, only one major market with more than 500 sales last year, grew this year. Canadian real estate sales in markets with more than 500 sales in 2017. The biggest weakness for Canadian real estate sales were Vancouver, Fraser Valley, and Hamilton. Vancouver reported 1,094 sales in December, a 41.8% decline compared to last year. Fraser Valley, a suburb of Vancouver, reported 739 sales, down 41.8% from last year. Hamilton, a suburb of Toronto, reported 534 sales, a decline of 26% compared to last year. The percent change in Canadian real estate sales, in markets with more than 500 sales in 2017. Where’s Toronto and Calgary real estate at? Toronto reported 3,781 sales in December, down 23.3% when compared to the same month last year. Calgary reported 985 sales, down 24.2% from last year. The sales declines as a ratio were both middle of the market, relatively speaking. The sales declines are being attributed to market restrictions in Toronto and Vancouver, as well as mortgage stress testing. That makes sense if you’re looking at it in a vacuum, but broader weakness is being observed across the country. Markets not subject to a foreign buyer tax are also seeing weakness in sales. A tax in Toronto isn’t impacting Edmonton or Ottawa. National mortgage stress tests make a little more sense, but not much more. Most markets with declines do not have home prices detached from local incomes. That doesn’t mean prices are fair value, but it means the stress test has minimal impact. The typical family in most cities can afford a typical home. Only households buying “too much” home are impacted by the restrictions. More likely, we’re seeing the impact of rising interest rates, and a contraction in general credit applications. It happens nearly every time interest rates rise. This is a classic case of the saying: “when it rains, we all get wet”. Unfortunately, we all have to somehow pay for the exuberance of some idiots. They soaked the economy to save homeowners. It happens. Hopefully wealthier Canadians bought hedges against devaluation of the currency and asset correction. What is meant by, “Hopefully wealthier Canadians bought hedges against devaluation of the currency and asset correction.”? Nice observation. The decline in growth happened in February 2016, after global credit begin slowing. Casual observers and the media blamed the only issues they heard about. Canadian economists are the equivalent of people that blame the devil when bad stuff happens. I don’t understand, so it must be the only thing I know. No need to analyze. Might have something to do with China reducing investment in Europe by 73% and the US by 90% since 2016 (Canada got a lift from 1.7B to 2.4B because China bought some more Canadian Mines). Took me a second. That was good lol. What are people surprised when the business cycle is cyclical? Because the cycles have been getting longer than 7 years, and the 2008 financial crisis made us skip a downturn when interest rates around the world went very low in response to the crisis. A significant portion of homeowners and potential buyers have never experienced a downturn. The mentiality has been to borrow as much money as possible to buy the biggest house, because that will make you richer. The thought that housing could go back to 2000 levels adjusted for inflation is alien to their thinking. I really should start spellchecking my posts before hitting “post”. Could you give a number as % down from current prices for if housing were to “go back to 2000 levels adjusted for inflation”? I guess I am too lazy to go look up the numbers for inflation and home prices over the years. Ha! Same way the universe will stop expanding and eventually collapse itself back to nothing. Don’t sweat the small stuff. Once again, as bad as these stats are, reality is even worse. Vancouver’s sales fell more than 41%, as per Zolo, Canada’s largest real estate brokerage, putting out real time, honest stats with no agenda, unlike CREA, VREB, TREB. Vancouver’s actual drop was closer to 60% and now in January its even worse. Ross Kay owns Canada’s largest real estate consulting firms which has access to nationwide data and he is publicly accusing CREA of putting out false stats. Why? Because they are, he is right. Yep, people are getting fed up with these Frankenstats. Vancouver’s market is completely frozen up, which doesn’t happen even in a 40% drop of sales. Better Dwelling, why are you reporting Teranet and other highly dubious sources known for massages stats? Why is the BoC back stopping this correction? Why are wages in Canada flat or declining despite full employment? Why are economists and asset managers claiming we’ve hit bottom? When there is a recession in the next 6 months everything we know to be true will be over. Tock. BD4L. Are you being sarcastic or for real? Or really sarcastic? You cannot create real wealth by inflating assets like house, currency. Real wealth can only be created with manufacturing and selling natural resource. Inflation is not a way to create real wealth, eventually it deflate. They get to the point in a way disengaged folks can understand.